Cloud Nine - Gorgeous 4 bedroom home with hot tub and in-ground pool. Sleeps 8 Adults and 4 Children. Dog Friendly. Come and relax at Cloud Nine! This 4 bedroom 3.5 bathroom pool house is located in the heart of Union Pier, Michigan and has just been remodeled! Lake Michigan is within easy walking distance via quiet neighborhood side streets and your access to both Gordon Beach gives you hundreds of yards of private beach to enjoy. There are four bedrooms, beginning with the south master that has a king bed, a twin bed and a fine bathroom en suite. The second bedroom suite in the back of the house has a king and a huge brand new bathroom en suite. The front bedroom has a queen bed and a twin bed and shares access to the hall bathroom, which services the fourth bedroom which contains 2 bunk beds and is great for youngsters. Stay in the house and keep cool, or you can lounge around the pool, relax in the hot tub, and enjoy s'mores around the built in fire pit! There is a cute screened in cabana for outdoor dining, horse shoes along the side of the house and an outside shower for rinsing off the beach sand. In addition, the shops and restaurants of downtown Union Pier are also within walking distance, so you can get the morning paper and a cup of joe or grab a bite to eat at Nani's! Please note - the pool at Cloud Nine is 20 feet long by 11 feet wide and 4 feet deep, so it is smaller than your average pool. It is surrounded by a full size sun deck and has a key-operated electronic retractable cover for safety. 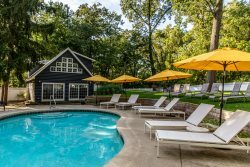 Please note that the hot tub and pool are available during the summer months only, generally from Memorial Day weekend to Labor Day weekend. Please ask our office specifically if you are thinking about dates just outside this time frame and we may have some flexibility. we were sorry that there was no DVD player in the home. This made it impossible for all of us to gather around and watch our favorite movies. That would be a recommendation for future renters. Everyone was very polite. The people who came to stock items and the pool company. And the people in the office. Jon was very helpful throughout the process. And we left a few items and he was very kind about helping us locate them and getting them back to us. We really appreciate that. We had a great time. The pool was perfect for our five young children. And the bunk bed rooms as well. Great time, great location, good space for the whole family.